Wyoming was blessed with many fascinating moments in 2018, some captured by photographers. This gallery will remind us of our unique homeland state. 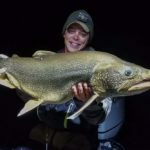 Game and Fish biologists hauled in a 29 pound lake trout from a survey on Jackson Lake in October, then measured, tagged and released it.